Binance to Turn Into the First Decentralized Corporation in the World? Home - Forex Analysis - Cryptocurrency - Could Binance transform into the first decentralized corporation in the World? Could Binance transform into the first decentralized corporation in the World? Over the last couple of years, Binance, one of the world’s leading cryptocurrency exchanges has seen a meteoric rise. Much of that success can be attributed to the unprecedented cryptocurrency boom of 2017. Crypto and blockchain seemed set to overtake the world by storm back then. Nowadays, the market is more mellow, but Binance is still incredibly successful. 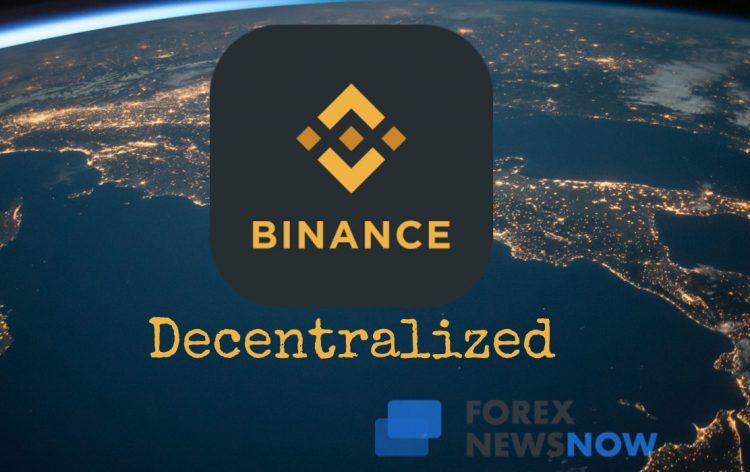 Now, the latest news report that Binance could transfer all of its monetary value to the platform’s native coin BNB. This would effectively make Binance the first decentralized corporation on the planet. If the events unfold that way, it will set a historical precedent that others might follow. Not much is known about the extent of this project Binance plans to undertake. Hopefully, more will be revealed as time goes on. This is highly unlikely to be as quick a process as one might expect. But if the plans are set in motion in the nearest future, we could see the value of Binance completely transferred to the native Binance Coin (BNB) somewhere within a 5-year range. The length of the project depends upon a lot of variables. Not the least of which would have to be the overall state of the market. Who knows what the crypto industry will look like in 5 years? This is an extremely ambitious undertaking and a risky move by Binance. However, it does suggest that the company has high confidence in itself. It also suggests that binance fervently believes in its future plans and the future of blockchain in general. Ever since it launched, the Binance exchange along with its native currency has had amazing success. Binance brought in nearly 450 million USD in 2018 alone, despite the bear market that has enveloped cryptocurrencies. Binance has been an incredibly versatile tool for crypto traders for years. It provided the community with everything it required at the moment. Wide selection of cryptocurrencies, a bunch of crypto pairs, and a reliable, secure, and functional platform to conduct their trades. All of this lead to the company becoming the crypto giant that it is today. As for BNB, the platforms native coin clocked in at 24.46 USD per coin at the beginning of 2018. Even though like all cryptocurrencies, its value fell significantly over the year, it’s still a solid coin. Currently, 1 BNB is valued at approximately 15.90 USD. The coin has pretty much tripled in price since the beginning of 2019. It’s now the 7th biggest cryptocurrency in the world by market capitalization. The market capitalization for BNB stands at nearly 2 and a quarter billion dollars. And now, it would seem that Binance has plans to completely transfer the asset from the widely used and almost universally adopted Ethereum network to that of Binance. Could Binance chain overtake Ethereum in that regard? The company’s own blockchain network is promising to take the industry a step further. And it’s not just talking. Binance is a high-quality company and likes to act on its plans in a timely manner. The testnet for the company’s blockchain already launched this February. Binance blockchain will reportedly perform the core function in the operations of its decentralized exchange, dubbed DEX. Dex will be a part, or rather – a separate part of the Binance platform. The new decentralized exchange plans to provide an efficient, fast, and reliable trading system for its users. On top of this, apparently, commissions and fees that the DEX collects will be transferred to the Binance blockchain validators. It’s important to note that the decentralized exchange that Binance is crafting will be a non-custodial platform. Given the fact, that the parent company has an excellent reputation among the community, it’s highly likely that it will become hugely popular even before it leaves the testnet phase of the development cycle. It won’t have to go through the trials and tribulations that newcomers to the market are often subjected to. What is the company trying to do? Binance appears to be the snake eating its own tail. However, according to Unchained podcast host Laura Shin, that’s not a bad thing for the company. Quite the opposite in fact. It appears that after devouring itself, the Binance snake could actually end up bigger and fatter than it was before. Unchained podcast is one of the leading platforms for crypto news and discussion nowadays. It’s held in high regard within the blockchain community. This is the statement that Laura made during a recent episode of the podcast. Sharing more of their thoughts on the Binance platform with each-other, Unchained podcast guest Tushar Jain also chimed in with his two cents about the nature of the company and its role in the progress that the cryptocurrencies have made. The conversation also touched upon the simple, yet brilliant way that Binance managed to make BNB so successful. So there you have it. Binance has consistently been one of the world’s leading cryptocurrency exchanges for years now. And now it seems that the company is once again paving the way in the world of cryptocurrency and blockchain when it comes to innovations. Will this one be as successful as some of the other tasks that the crypto giant has previously undertaken? Only time will tell. If the company’s track record is any indication – yeah, most likely. The project is solid, the plans seem achievable and Binance appears to have a clear, well-formulated roadmap of where it’s going with all of this. Meanwhile, one thing is for sure, the recent innovation trend is sure to contribute to ending the bear market that has plagued the cryptocurrency industry for over a year now. We might never see the astronomical gains we witnessed in 2017, but the future is still bright. The fact that the uncontrollable growth of crypto has somewhat died down also means that the governments are also less inclined to roll out harsh regulations in order to contain the chaotic processes. The bear market has given both the industry and the world around it some very needed time for deliberation, regrouping and moving forward with a clearer vision of what to do and what’s to come. Let’s see what else 2019 has in store and which direction the movement will continue in.